A few weeks ago, I caught the tail end of a Focus on the Family broadcast. It was a woman with a Dutch accent telling a small part of her story of evading the German officers who were trying to arrest her because of her efforts in the Dutch Resistance movement. Deit loved Jesus. She was passionate about following his will, no matter what that meant. She was engaged to a man who loved Jesus just as much as she did. Their love story reminded me so much of me and Rob when we were dating. They were great friends, yet partners in a greater cause they knew they were born for. Deit and Corrie were from the same town. They were at the same prison for a while. After the war they became good friends. They suffered together. They saved God’s people together. Deit’s fiance’ Hein died in a prison camp. Her story was a long time in coming because it was simply too painful for her to tell. I am so glad she decided to. I am a better person for reading this book. 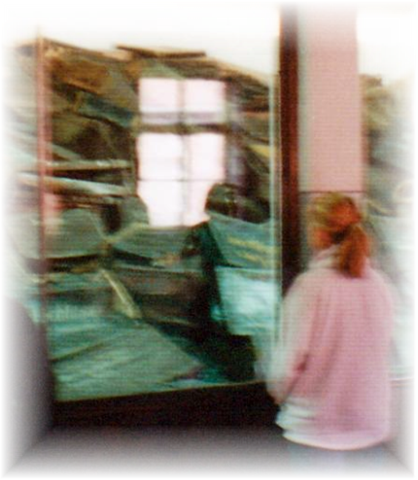 This photo is one of me at Auschwitz a few years ago. I wrote my thoughts about that experience here if you want to check it out. Years ago I went to Europe and during my time there I visited Dachau. I was 16. But it made an indelible mark in my mind and heart. I have wondered many times how Christ followers of the time must have thought Hitler to be the very manifestaion of evil. Especially so after all the propaganda was rinsed away and the truth of those atrocities was revealed. And I can relate to how this doesn’t come up in everyday conversations, but it’s still a part of who I am. Thank you. Michelle: We’ve never formally met (passed at GCC events, etc.) however, I do enjoy your blog. I learn a lot reading it. Especially, your posts about Corrie. I’ve never encountered anyone before who has read her as much as I have. Usually if I mention her in a conversation, I get a blank stare. I have a journal where I put quotations and she fills up pages upon pages. Just wanted to share that with a fellow Corrie fan since I don’t know another! I too caught the end of this focus on the Family show. To my surprise it was on again, and I got to hear this woman and her story. I told my daughter and she got the book for me as a gift. If ever you think life has done you wrong, read this story. I am truly amazed and have so much love and admiration for this woman and anyone like her. It makes you appreciate what God gives you. It shows you how to find strength, to use for times when life seems unbearable. I appreciated your comments about Diet. She is an incredible woman. We have published a new edition of her book with added photos. May I send you a complimentary copy? I’m not a great reader, but read Deit Eman’s book 10 years ago after hearing part of her story on Public Radio. It is a powerful testimony which left me always appreciative of my circumstances.